This is something I used to do all the time last year because the surprise factor helped Kiddo get in the tub when he was going through an “I hate baths!” phase. It’s really easy… just freeze some small toys in a plastic container. When you put it in the bath, the ice slowly melts to release the toys. I decided to try it again this year but with a literacy twist. 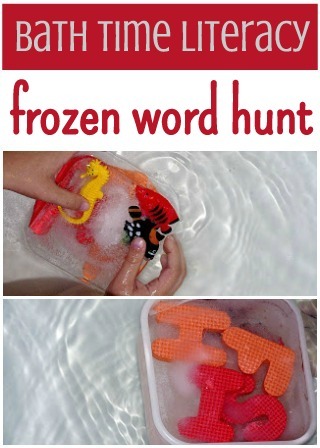 Instead of freezing random objects I chose a couple of fish toys and the letters F I S H. (We have a set of these bath letters and numbers – affiliate link) Kiddo liked the idea of a scrambled word mystery and asked me to do it again for tomorrow’s bath. Since Norris's whole life has been an “I hate baths” phase, I wish I'd thought of this — 4 years ago — and will definitely try it out. Much better than skipping baths, which has been my way of dealing with this issue. I am so impressed by your creative parenting! Yes, the “I hate baths” phase is definitely challenging. This works for a while, and sometimes I withhold the “surprise” until after he was soaped up, or his hair was washed… or whatever needed to be done. But we have also had our stinky stretches, when I just let him not take a bath! Cute idea! It is only going to be 60 degrees today here in Seattle so we will be taking a warm bath but next time it is hot (ha) I'm going to try this one. This is such a great idea! I love the scrambled word game…. that's a nice twist! great idea! today i discovered the joy of freezing toys for a plastic dinosaur excavation! i love this idea too.